Northumberland is a beautiful, peaceful county. And with only 62 people per square kilometre, that should probably not come as much of a surprise. Situated between England and Scotland, Northumberland has been a frontier zone throughout history. During the Roman occupation of Britain, most of the present county lay north of Hadrian’s Wall and was only controlled by Rome for the brief period of its extension north the Antonine Wall. 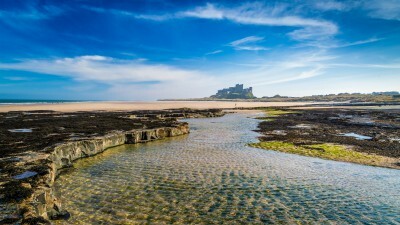 As evidence of its border position throughout medieval times, Northumberland boasts more castles than any other county in England (70 at one time), including those of Alnwick, Bamburgh, Dunstanburgh, Newcastle, and Warkworth. A large portion of the county is protected as the Northumberland National Park, covering over 1,000 square kilometres (400 square miles) between the Scottish border in the north to just south of Hadrian’s Wall. The Northumberland Coast is also a designated Area of Outstanding Natural Beauty. Northumberland has some unique traditions, too. These include the rapper sword dance, the clog dance, and the Northumbrian smallpipe (a sweet chamber instrument, quite unlike the Scottish bagpipe). The county also has its own tartan or check, sometimes referred to in Scotland as the Shepherd’s Tartan. For those wanting to explore this beautiful destination, Northumberland is easily accessible by road, rail, and air from all corners of the UK (Newcastle International Airport is just 25 minutes south of Morpeth). To help you make the most of this wonderful county, here are a few of our top places to visit and things to see and do in Northumberland. As previously mentioned, Northumberland has a great collection of castles. Many have been lost over time, whilst some are romantic ruins, such as Dunstanburgh Castle and Berwick Castle. One of the most magnificent is Bamburgh Castle. Situated on the coast, the castle was the royal seat of the Kings of Northumbria but later fell into disrepair before being fully restored in Victorian times to the mighty structure you see today. Lying to the south of Bamburgh is Alnwick Castle, which many will recognise as it doubled as Hogwarts in the Harry Potter films. Alnwick Castle is the second largest inhabited castle in England after Windsor Castle. Whilst visiting this majestic structure, you must also visit the wonderful Alnwick Gardens, which includes a poison garden full of dangerous plants, and one of the largest treehouses in Europe. For a great family day out, there’s also Warkworth Castle, set on a hilltop above the River Coquet, and splendid Chillingham Castle, reputed to be one of the most haunted castles in the country. The magnificent Northumberland coast is one of England’s best-kept secrets. With over 30 miles of sandy beaches, hidden coves, and a designated Area of Outstanding Natural Beauty, this is a must visit. There are some wonderful seaside villages to explore such as Amble where you can try some traditional local fish and chips, or pop into a local pub for some of the great local beers in Low Newton-by-the-Sea. Also fun is taking a boat trip out to the Farne Islands to see puffins and grey seals. Whilst the castles and coast are great places to visit, a must see is of course Hadrian’s Wall. This is one of England’s greatest landmarks and joins the Great Barrier Reef in Australia and Yellowstone National Park in the US as a designated UNESCO World Heritage Site. The best preserved frontier left over from the Roman Empire, the wall was used by George RR Martin as inspiration for Game of Thrones, and Kevin Costner and Morgan Freeman visited the famous Sycamore Gap in the film Robin Hood: Prince of Thieves. Take a walk along some of the many stretches of the wall which will allow you to see parts of the Northumbrian landscape in all its glory, and visit some of the archaeological sites and museums along the way which tell the epic story of Rome’s rise and fall. Lying just a few miles off the Northumberland coast, the Holy Island of Lindisfarne should not be missed. You travel across a causeway from the mainland (making sure you know the tidal timings so as not to get stranded! ), past sand dunes to a picturesque village. From here you can visit Lindisfarne Priory, the epicentre of Christianity in Anglo Saxon times and the birthplace of the Lindisfarne Gospels, one of the world’s most precious books. 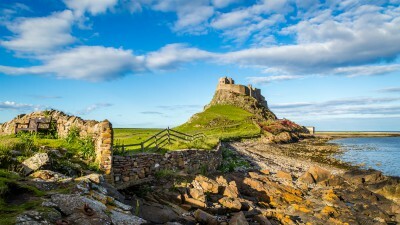 Perched on a sheer rock face in the north of the island is Lindisfarne Castle, built to defend a harbour sheltering English ships during skirmishes with Scotland. Northumberland has some wonderful luxury hotels scattered around the county. 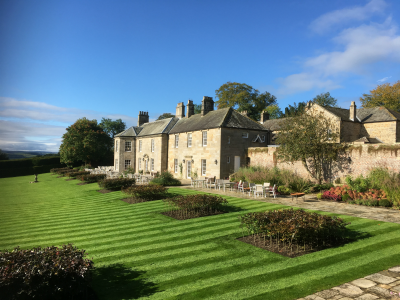 Just along from Hadrian’s Wall is Walwick Hall, a truly unique countryside retreat tucked away in the heart of rural Northumberland. Set in 100 acres of beautiful countryside, this imposing Grade-2 listed hall was built from local stone and is the perfect place to relax and unwind. Highlights include 10 beautifully appointed bedrooms, a spa, a gym, and a restaurant serving food fit for a king (or queen). Just off the A1, not far north of Morpeth, and hidden amongst the trees along a narrow country lane sits Eshott Hall. The hotel has a selection of tastefully designed luxurious bedrooms with wonderful views over the 70 acre grounds. The hotel also boasts a number of self-catering holiday cottages and is an ideal location for weddings. A sister hotel to Eshott Hall is the equally magnificent Doxford Hall, 20 miles north of the beautiful Northumbrian town of Alnwick. Doxford Hall is a perfect luxury country hotel for all occasions, be they celebrations or a relaxing weekend in the wonderful Northumbrian countryside. TMA Howe is Luxury Globe Media’s UK Automotive Editor and an avid traveller.